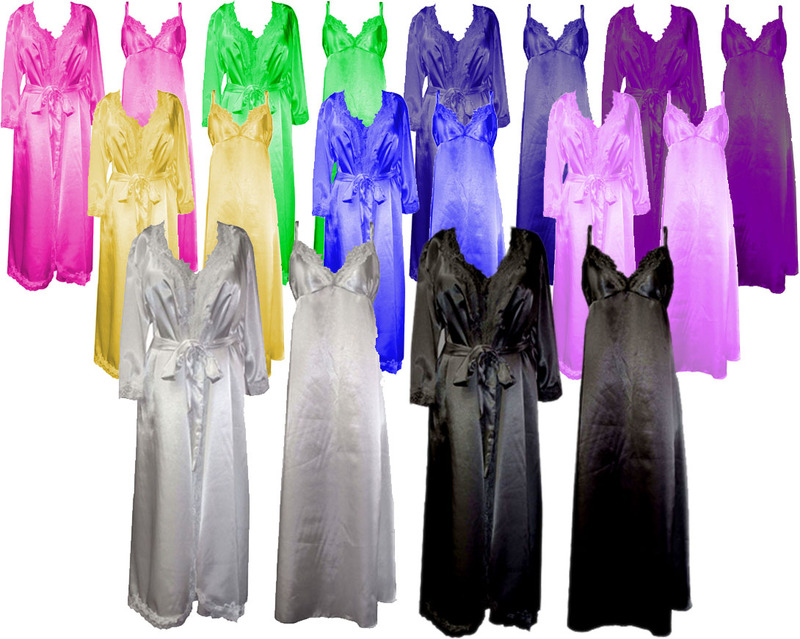 This beautiful satin nightgown and robe set is truly one of a kind! 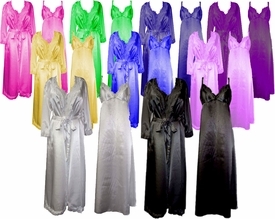 The nightgown has a lovely plunging V-neck with lace trim and double spaghetti straps. The elastic srtetches across the back and makes for an ultra comfortable, flattering fit around the chest. It is approximately 50" long and made from a poly-blend fabric. The robe is trimmed with a beautiful lace around the edges and cuffs. It has belt loops on either side and comes with a white tie. It is approximately 50" long and , but available shorter or longer as a special order. It's made in the USA from a washable poly-blend fabric. 0x: Chest:34-44" - Hips (appx):60" - Bottom Sweep:100"
1x: Chest:38-48" - Hips (appx):64" - Bottom Sweep:108"
2x: Chest:43-53" - Hips (appx):67" - Bottom Sweep:110"
3x: Chest:48-58" - Hips (appx):72" - Bottom Sweep:124"
4x: Chest:52-62" - Hips (appx):75" - Bottom Sweep:124"
5x: Chest:58-68" - Hips (appx):80" - Bottom Sweep:130"
6x: Chest:64-74" - Hips (appx):86" - Bottom Sweep:138"
7x: Chest:68-78" - Hips (appx):88" - Bottom Sweep:142"
0x: Chest:42" - Hips (appx):64" - Bottom Sweep:100"
1x: Chest:48" - Hips (appx):68" - Bottom Sweep:108"
2x: Chest:52" - Hips (appx):72" - Bottom Sweep:110"
3x: Chest:56" - Hips (appx):76" - Bottom Sweep:124"
4x: Chest:60" - Hips (appx):80" - Bottom Sweep:124"
5x: Chest:64" - Hips (appx):84" - Bottom Sweep:130"
6x: Chest:68" - Hips (appx):88" - Bottom Sweep:138"
7x: Chest:72" - Hips (appx):92" - Bottom Sweep:142"